How can I describe Shy River? A rocker both colorful and complex with roots in folk, blues, jazz, and fusion. The title brings to mind the book Harpo Speaks. After years of being mostly non verbal, Mr. Marx is said to have become quite garrulous. The levy has broken and Shy River is flooding in and none of its tracks are instrumental. It flows in many directions. Inspired by films, family, heroes, emotions and thoughts, the thirteen songs reflect the influence of his father, Dave Guard who wrote the album's country-style ballad, Above and Beyond. Another song proudly covered is See Emily Play. Backed up vocally by his kids, Tara and Pascal and sister, Catherine, Tom mixes the Syd Barrett classic with tabla, bagpipes and banjo. Tom's song, Between You and Me shares diverse spiritual nudgings from slack key master, Gabby Pahinui, Pete Seeger and Pete Townsend. She asked "Who is it?" What if he's come back? This was the first song I wrote for Shy River and it is followed respectively. I thought I'd rather start a song with a vocal melody than develop a catchy riff. There was a movie I'd seen as a kid called Whistle Down the Wind. It was about an escaped convict who hides on a farm and is found by a girl who believes he is Christ. Soon rumors get out but the secret only lasts until the adults catch on and Blakey is captured. He never claimed to be Jesus but the kids were convinced having been reminded repeatedly about the good samaritan himself. The twelve string's tone provided a great theme. I'd begun creating MIDI files at home and actually produced a few we were able to use at RProductions, Peter Rubbo's studio. Peter was very taken by the uniqueness of the song and urged me to sing more harmony tracks. My sister Catherine's husband Leonice was in town so we recorded some tabla as well. There were quite a few tracks for a first song but it felt right. At one point I wanted some cymbal crashes to resemble thunder at the onset of some verses. Peter took a sound byte of a cymbal, copied it, reversed it and combined it and we had thunder. I tried tin whistles and it added an even newer tone to the song. The track list became so full that the song was discovered by musician/producer friend of Peter's who was needing a photo of his mixer in action with lots of meters ablaze. Quick thinking brought Crossing Over the Road to mind. When the guy heard it, he loved it. Peter emailed me to share what he'd said, "This is good stuff. you don't hear songs like this. Hat's off to him." That vote of confidence pushed me to really get some more ideas out without hesitation. Peter still thinks it's the best song. George Dussault, another producer who drummed on the record later, had also singled out the tune from several others and said "I like this. My band needs more tunes like this." Hopefully more than just producers will like it but it but that's not a bad group to have on your side. Developed from a chord progression and freestyling vocals onto a cassette, this song gradually grew into a myriad of verses, choruses, two bridges and an outro. Keeping it simple to start would have been wise but something said, "Make it whatever it needs to be." I brought in Andy Solberg, a fellow music teacher who could really play. He said exactly what my sister, Catherine said about it, "It's all over the place." but I convinced them both it had gravity and they could do it and they did. Andy did a great job of putting a Duanne Allmanish feel all around by playing responses after vocal lines. We ended up letting all of his three passes play loud simultaneously and it worked. Catherine advised me that certain harmonies like some on Crossing Over the Road could be improved upon. She re-iterated my father's advice by stating that harmony lines should rise or remain if the main vocal is falling. So we managed to do some fast changes before recording her backing vocals. Peter offered to both drum and record so we chose to take four songs-in-progress and see what would resut. His abilities really added to the jazzier aspects of Crossing Over the Road and especially Shy River which has a bright bridge towards its ending. I Have It In Mind, was not so jazzy but a common musical influence of ours made it a good match as well. In 2001 my younger sister, Sally passed away after battling the same form of cancer that took our father's life ten years before. I moved from California to Massachusetts to help her family and co-parent my kids. After months of getting settled I met a woman named Karen and any feelings of loneliness disappeared. We both had kids we loved and we were working hard to keep it together. Neither of us had been in a relationship for a long time since we were working and co-parenting. Something had said to me in my trying moments, "Hold on. Something wonderful is coming" and that was Karen. I often draw from the symbolism in Pamela Eakin's book, Tarot of the Spirit. In the chapter about the Tower card she shares Allan Watts' WW2 experience of feeling Satori despite bombs exploding around him. Everything we ever build, know and love can crumble at any time. Karen helped me through my tower of sadness and change. The song is there to thank her by saying, "Maybe I say too much but being shy can pass for being shallow and my love runs deep." Ironically, this is among the longest of the song descriptions. Karen and I are very happily married now. Enough said! It's time to let go of your pride. For this one I made use of one of those riffs I couldn't ever get out of my head. It started as an angry lyric, "Cry if you want. Nothing's going to make me hang around." Lots had to change there. The vocal line was too closely matched to the riff. I freestyled a vocal over just the bass line and came up with, "What have you done about it? ... about the things that never sat with you too well" I was never one to tell someone I didn't care about their crying so I followed with, "I'll cry if I wanna' cry, 'cause I have it in mind" ... about the things that never sat with me too well ... that is. Peter loved the lyric and, with only the bass track to go by, managed to play some astonishing drums. We both like the band Tool. They play in odd meters and write great lyrics. Their densely compressed songs physically grab you. Tara and Pascal's singing on the song comes through clearly thanks to a welcome addition to Peter's RProductions studio six months before the project wrapped. That being a Yamaha DM2000 mixing console. If the record hadn't taken a long time to make that beautiful machine wouldn't have been involved in the mixing. Both the riff and chorus were stewing for a long time. There was only one lyric so far where the chorus breaks, "In a day when the Shock Wears off, things come to terms..." I just had to elaborate on that. Joseph Campbell's mythical heroes were the basis for my story of a guy who walks the plank as pirate's jeer him on. After being marooned the lad is saved by the dragon from his nightmares only to find it was all just a dream after all. I'd met a guy named George Weissinger through the Kingston Trio grapevine who offered to help on the track. I asked for banjo but he also sent twelve string tracks which I used instead because they worked so well. I thought my $200 Yamaha twelve string sounded as good as any but when I heard his Martin twelve I was floored. I'd liked playing them at the store but didn't think they would record so well ... and they do. That was the first try at farming out work remotely and it really worked. Peter told me it poses problems with the mastering since it varies things but I took his advice and created lots of head room on the tracks recorded at places other than his RProductions. We recorded Peter's drumming on this and the previous songs. He'd done this cracking Salsa-style thing that inspired a jazzy piano piece at the end. The piano was created in Finale with my Alesis keyboard. I'd bought a MIDI/USB cable and received with it a lesser version of the same recording program Peter uses, Cubase. That helped me realize how much I could create from home. The piano part was recorded to MIDI at half tempo and later brought to speed. The song is very short and the last half is instrumental so I'm hoping to extend a lengthy jam from that danceable groove when we play it live. It's the last track on the record so I'm glad it ends in a very "ending" way with a big chord at the end. didn't apply to love and pleasure. It helped this living legend rise above. It won't sound too harsh if we call it a coup!" I while ago my sister's husband, Leonice and I had jammed to a bass sequence I wrote. The whole thing turned out wonderfully and there was a hook right at the end before our tape ran out. I used it throughout Pascal. I tuned my bass to EBEA so I could easily make chords and Peter used a Cowboy Direct In Box through a Focusrite Pre-amp. Even that was astounding. We used that setup on every bass track. I had a click track but it helped to have Peter conduct it as well. Karen liked the raw sound of just the bass, vocal and harmonica but the riff is so repetitive that added a lot of guitar. 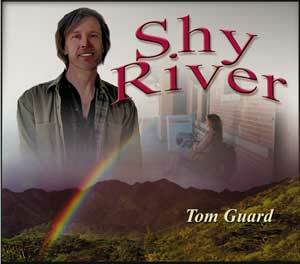 I was getting impatient about Shy River. I'd pushed the ETA back several times and anxiety was crawling in . Gearge runs his Galilee Productions out of his home in Rhode Island. He's an ace guitarist, engineer and teacher at White's Music where we met. Although he was young he knew all about my dad's work and that of his colleagues. I felt it right that George should share those influences by drumming on eight of the more retro-sounding tunes. A while back I was jamming with a pianist on a four chord progression. I used a bottle neck slide that living-blues-legend, Alvin Youngblood Hart gave me on my six string Guild D40 tuned open to CGCGCE. I'd freestyled some words as we recorded onto a cassette and I knew it was worth developing. On the harmonica track I used a separate harp for each chord. A G harp where the G chord went etc. I asked Cameron Greenlee to come over and make a MIDI piano recording. He did a great job of sight reading. It was good to know the chart could be read and performed with such feeling. George drummed on this one too. He managed to take the two songs about my kids up five notches. The song is about my daughter and, like Pascal, it wasn't great until those drums came to be. Geworge recorded his tracks when time alloed and I'd received a daley MP3 sent via email from Galilee. I hadn't really needed to be present when he was recording the tracks because he'd done a great job with just listening to a few ideas. Still, I wanted to be a fly on the wall for a session and Pascal and Tara Shakti turned out to be the songs that day. Something about the lead in fill at Tara Shakti's start just ignites the song. It makes me want to dance like I'm one of the Specials wearing a Pork Pie hat. My dad's family and friends wandered around tidepools at Maka-pu'u Beach, Hawaii in 1991 debating over where to spread his ashes. His closest friend, Cyrus Faryar said it all when he remarked, "We could really use someone like Dave right now." I realized then that Cyrus knew him well. Outspoken yet trusted and rarely one to fail, Dad seldom lost an arguement. At my last hospital visit with him he described his younger self as being hyperactive. Despite his success and the smugness it implied, he still seemed to seek people's approval by sharing the knowledge from his steel-trap memory. I was touching to see him in the role of a carried-away conversationalist at a party. Dad would often roam around the house improvising lines like the one I wrote for the song, "Awake and alone and alive ..." It seemed an appropriate sentiment for one who has gone through another trying endeaver. In my case, it was his early passing. Another line, "still you would put yourself first after years of denying the worst" is a reflection on his only child persona. I never had a brother so it was good to have him as a friend and I hope he felt the same having never had a sibling. He once told me, " It's funny our birthdays are exactly six months apart, but we seem to get along fine." The title came from a thank-you letter a kid had sent him after a talk he gave on his book, the Hawaiin Legend of Hale Mano. The third grader's letter included a drawing of Dad sitting on a desk speaking to a classroom of kids. It came at a very healing time that followed a rocky period in his life that I shared a large part in. Dad told me salesmen, with phonebook in hand, would often call and begin with , "Hi Don ..." Dave was actually his middle name and Donald, his first. He always knew when it wasn't a dear old friend touching base. So I made the play on words with that fond memory in mind; "How can each day begin without you Mr. Dawn?" This is my oldest song. At seventeen I loved John McGlaughlin's work so I composed a similar chord progression to some of his songs and put it to a friend's poem. Often Dad would interupt my playing to share a word of advice; A frustrating but useful thing. I was playing it once and he gave me a, " sounds good!" I knew a song was worth pursuing. After years of lyric and arrangement revisions I recorded it with Peter Rubbo on drums. I'd asked George to drum it but he had no time so it's fortunate the cards fell that way because the song is, like Peter, on the jazzy side. punishing you for those innocent things. and all of the pranks by my dad. living so long on your own. and the soul of your grace. The voices in my head were saying, "What about that 'song-a-week' you promised?" I grabbed the twelve string and soon a verse, chorus and bridge came along. Finally I'd found a key that was great vocally as well. Mama San, my grandmother who died in 2007, lived most of her ninety-five years in Hawaii. Papa San died in 1970 and she lived in a beautiful valley near Honolulu since then on her own. Despite a lot of incidents that would point to chosing a rest home, she chose to stay there and be independent. She was truly smart and strong enough to succeed and she did just that. Taking Karen and our kids to visit her in 2004 an celebrate her ninety-second birthday was great. We remember it well. She lived in a beautiful place. Mama San and I spent a lot of time on the phone. She was lucid as anyone and equally a pleasure to talk to until the end. George Dussault suggested he do some hand drumming on the track. During a vocal run-through I added whistling over the bridge and it stuck. A Bb harp was paired for an overdub with an Eb harp for the ending. The E string on the bass was tuned down to Eb so that low note could be reached which was good but it was easy to forget and then hit a sour note. I made it through but I'd hate to have to tune that way all the time. I took a razor and my rifle and the road to Arizona. They said I "stole" that ride outside Sedona. I call it what I call myself, "A temporary loner." with a meaning above and beyond. is the goal at the source. but, "Lover, you've got a lot!"